This article appeared in the January 2017 edition of Island Parent Magazine. The beginning of the new year is a fresh start—full of a variety of possibilities for outdoor adventure and exploration with kids. And it’s the perfect chance to make that resolution to spend more time outdoors with the children in your life. Now’s the time to carve out a path for this years’ adventures. As you start to make plans for your family this year, I encourage you to look at where your family spends the majority of your time. Ask yourself: how will I provide opportunities for my family to spend more time in nature? How can I get started right away this winter? 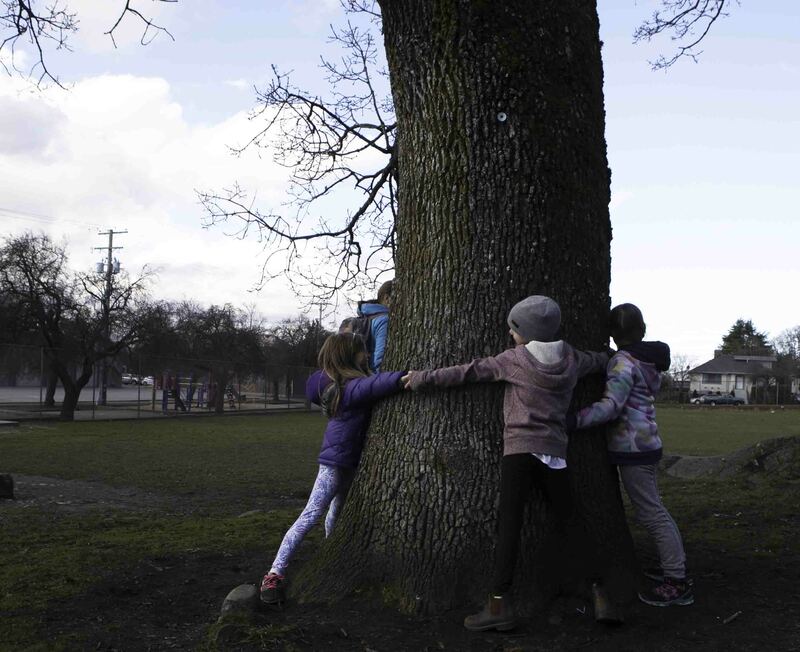 Kids at Quadra Elementary get outside to hug trees all winter long. Photo by Craig Janzen. Kids and winter get along just great. Kids love splashing in mud puddles. They dream about snowflakes that have potential to be made into snowmen. They crave the big winter waves at the beach that are full of loud, crashing sounds. Most of all, kids are amazed by the discovery of wildlife signs in the forest. So get out there and explore the beach after a big winter storm. Examine the diverse varieties of seaweed that have arrived on shore. Embrace the first snowfall with a walk in the forest to look at animal tracks or roll through the leaves down a hill. Go for walks in the forest and look for multi-coloured mushrooms popping up. Take this opportunity to look, listen and smell the variety of life that is alive and thriving during the winter season. Try taking your kids outside on a rainy day. Just remember to bundle everyone up with proper rain gear and gumboots. A fun thing to bring along on your adventure is some hot nature tea. This will to help keep you warm on your journey. The task: splash in the puddles. How many puddles can you find? What does it feel like to just stand in a mud puddle? How deep are the puddles? What wildlife also likes to enjoy the puddles? Are there any animals or birds you can see that need the rain for their survival? Try suggesting that your child pretends they are an animal living in the local ecosystem. Maybe they can become a black-tailed deer. As you continue on your walk, find places where the deer might go to find water to drink and find protection from the rain throughout the winter months. If possible, gather everyone together underneath a cedar tree. Find one that has low lying boughs that provide refuge from the rain drops. This may also give you an opportunity to stay dry for a while. Under these big branches is a great location to enjoy your hot tea. Enjoying the sights, sounds and smells of winter. Photo by Ayman Al muhana. 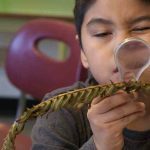 Encouraging kids to use their “deer ears” to listen, “coyote nose” to smell and “eagle eyes” to look for things outdoors helps expand their senses and knowledge about nature. Developing your bird language and sensory skills is rewarding and fun. Chestnut-backed chickadees, Steller’s jays, dark-eyed juncos and spotted towhees are common winter birds that will help get you started on your own bird watching journey. Listening to recordings online and looking at pictures of birds before you head into the forest will help you train your senses to spot them. As you are looking and listening for birds, take the time to smell the trees and touch the bark. A great little activity to do with kids is called “Greet a Tree.” With their eyes closed, carefully guide them to a tree in the forest. Get them to touch and smell the tree, with their eyes still closed. Then slowly guide them back, away from the tree. When they open up their eyes, they must go back and see if they can find the tree that they originally greeted. They will accomplish this task if they can successfully identify their tree by touch and smell. A fun artistic project to do together as a family is to make your own backyard bird feeder. You can make bird feeders from pinecones or recycled plastic juice or milk containers. Throw a tea party for the birds by picking up some fancy cups and saucers from your local thrift shop and filling them with bird seed to attract local birds to your backyard. Watch and listen as they become your daily visitors. Winter is meant for rejuvenation and discovery. 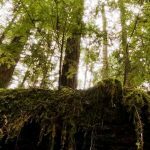 Enjoying the changing seasons is part of forming a deeper connection to a place. Repeat visits to the same place throughout all of the seasons will enable your kids to gain a greater understanding of that place and to sharpen their senses. So get out and discover something new this season together. Please donate today to ensure we can keep our environmental education program free and accessible for kids across BC.